Today's Draw: The Ace of Wands from the Pagan Tarot by Gina Pace. Do you feel a hole where your spirituality should be? Do you feel drawn to deepen your spiritual beliefs? Do you know what spirituality means to you? It is so appropriate that we begin this year's daily draws somewhat at the beginning...the spark of fire, the spark of life. All aces in the tarot are traditionally depicted as an offering from the heavens...a beginning of something new. There is a lot of energy behind them. Depending on the suit, they may be a beginning in the realm of emotion, thought, material needs or creativity. When what is being handed to you is fire, however, there's even more energy behind it. The wands speak to our ability to create, stoke passion or pursue spirituality. As Gina Pace puts it in her companion book, the Ace of Wands signifies a spiritual epiphany. And in recent years, there hasn't been a New Year with more spiritual buzz around it than 2012. So what is spirituality? Some people use it to mean the same as religion, but you won't see me do that. Religion is what is taught through books and words. It is experienced in the head. Spirituality is what you learn through your senses. It is experienced in your heart or core. The two work together beautifully. Or they can work independently. You don't have to know the Bible or a specific set of teachings (such as Jewish or Catholic beliefs) to feel God working in your life. And while I'm using the word God here, what I'm really talking about is something greater than the individual. It doesn't have to be a creator. It doesn't have to be a male energy. It doesn't have to be an entity. Indeed, in the way I believe, it's not called God, it's not an entity and it's not a creator...it's called the Universe, it's an energy and, in a way, life creates it, instead of the other way around. And I don't mean we create it because we're desperate to believe, I mean we create it because it's the collective energy of all that exists...something larger than the sum of its parts. Even some of the atheists I know are people I would consider spiritual, simply because they question "why". There is a lot of crossover between traditional philosophical thought and spirituality. While an atheist may not be attributing the answers to anything mystical, they're still asking the questions. And many feel a deep connection to nature and natural order, but again, don't attribute it to God. That doesn't mean they can't think about it like Rumi. But back to what most of us consider spirituality...if religion forms the basis of belief for many, spirituality is the part that is unique to the beholder. This may not sit well with religious people, but to me, religion is what man whispers in your ear about God, based on the interpretations and beliefs of other men going back thousands of years. Spirituality is what God whispers in your ear about himself/itself based on your personal relationship with him/it. For those of us who choose to set aside man's whisperings and focus primarily on what rises organically within us—and let's face it, none of us were raised in a vacuum, so our beliefs are colored by those man-whisperings we've heard around us all our lives, whether we like it or not—spirituality also holds the key to all of those questions that have captivated us since the beginning of time...who are we? Where did we come from? Why are we here? This Ace of Wands could easily represent the spiritual energy around 2012. There are a lot of theories of what will happen on 12/21/12 ranging from the apocalypse to "it's just another day". All that seems to be true is that, for one reason or another, the Mayans stopped their calendar on that date. It's given spiritual import because these dudes knew stuff about the cosmos that we've only in recent times been able to corroborate with all our machines and doodads. So they seem to have had some sort of advanced knowledge that came from who knows where. But those who know the complexities of Mayan timekeeping say it's really just the end of one calendar cycle and the beginning of another. Another thing about 2012 is that it's a "5" year (2+0+1+2=5). Numerologically speaking, it's the number of divine grace and the mediator between God and the universe. It is the number of both human and God. In tarot, the number 5 signifies the Hierophant and so 2012 is the Hierophant year. Sometimes known as the Pope or Pontiff card, he is the symbol of dogma, religious teachings and religion. But as Barbara Moore (tarot goddess) observes, "pontiff" means bridge...the bridge between theory and practice. Which is what you could call spirituality. In her definition of the Hierophant for her upcoming Steampunk Tarot, she says, "The Hierophant is one who teaches us how to live in accordance with our sacred beliefs. For those belonging to a group, community, or organized religion, there are usually teachers aplenty. For those who follow a more solitary path, they are often their own hierophant. This responsibility is often supplemented by studying sacred texts, works of art, private spiritual practices, and nature." So here's the thing...warranted or not, there's a lot of spiritual buzz around 2012. And by sheer virtue of the fact that so many are placing their attention on its spiritual import, it will likely become a self-fulfilling prophesy at the very least. So being the mystical woo-woo girl I am, it just seems like there's no better time for all of us to revisit, deepen or explore our spiritual and/or philosophical selves. 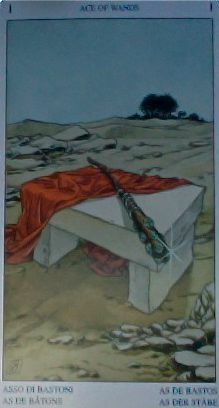 So that's what this Ace of Wands is coming here to tell us on the first draw of 2012. To stoke our fires and start at the beginning. Ask "why am I here?" "What have I come here to do?" "What's this all about anyway?" But more importantly, ask the most germinal questions of all...the ones we frequently forget to ask, like "How can I serve? ", "How can I reflect God's wisdom, grace and love with my fellow man?" and "How can I end the year a better person than when the year began?"